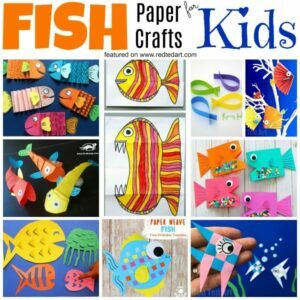 Oh my.. yes it is time for some MORE adorable Paper Fish Crafts!! 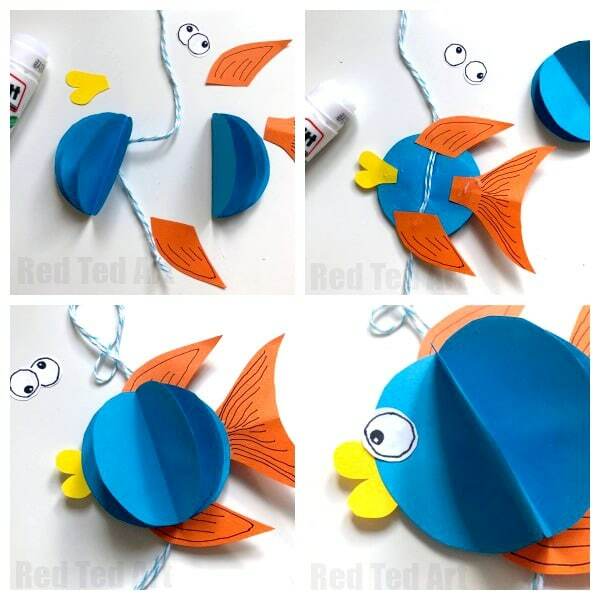 Today’s paper fish, comes complete with fish template (if you wish to use it) and is a great 3D Paper Fish decoration…. 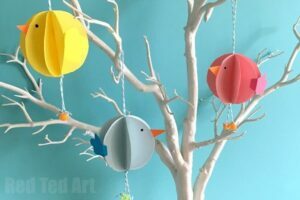 it is based on our favourite time of “paper craft decoration” – the PAPER BAUBLE!!! 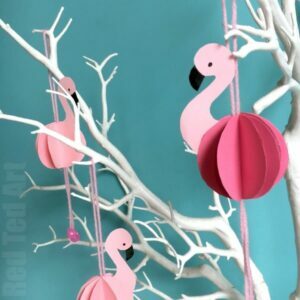 We have already turned this paper craft classic into 3d Paper Flamingos, 3d Paper Unicorns and 3d Paper Birds. 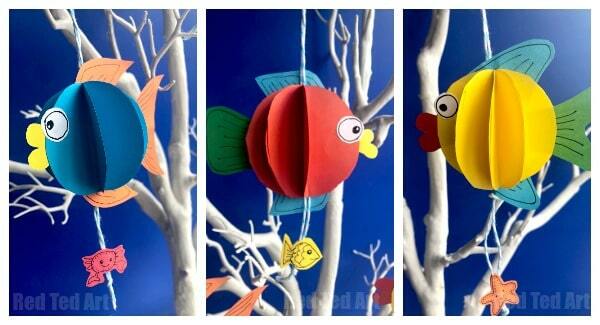 It is now time for these oh so cute 3d Paper Fish Decorations. 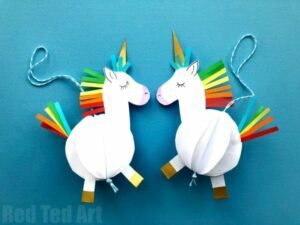 We do love a good Paper Craft for Kids! 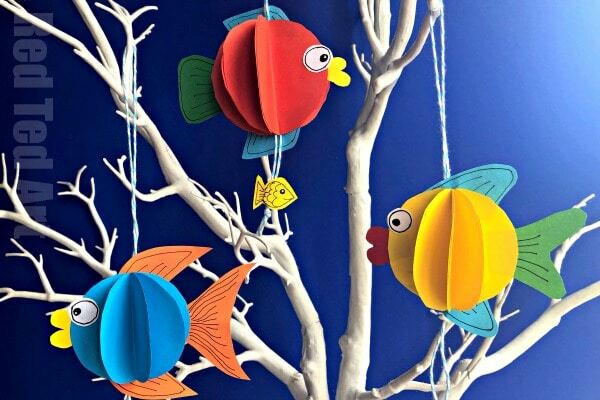 Today’s 3D Fish join our Paper Weaving Fish from a couple of weeks ago. 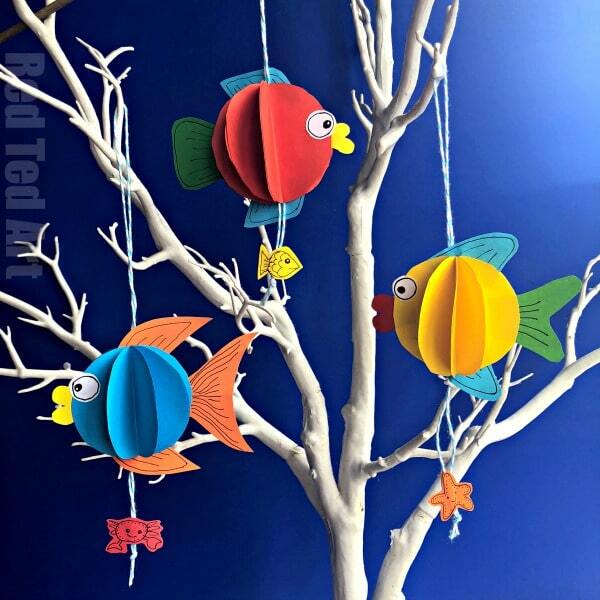 Something Fishy going on at Red Ted HQ!! You can use this free (rough) template here. 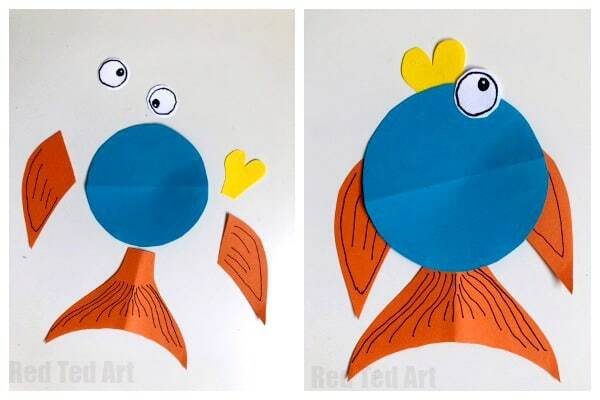 It has two different fish fin shapes.. but I encourage you to experiment and see what other fin shapes and patterns you can come up with!! 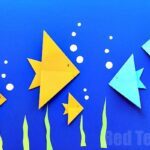 As with many of our crafts, I have a choice of a fun video to show you how to make these 3d Paper Fish, or you can follow the step by step instructions below! 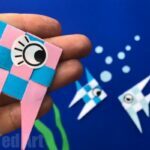 In this video, I feature some very special guests from my kids’ school – two of the kids’ friends (aged 5 and 7) were keen to have a go at making the fish and share their creations in the video! 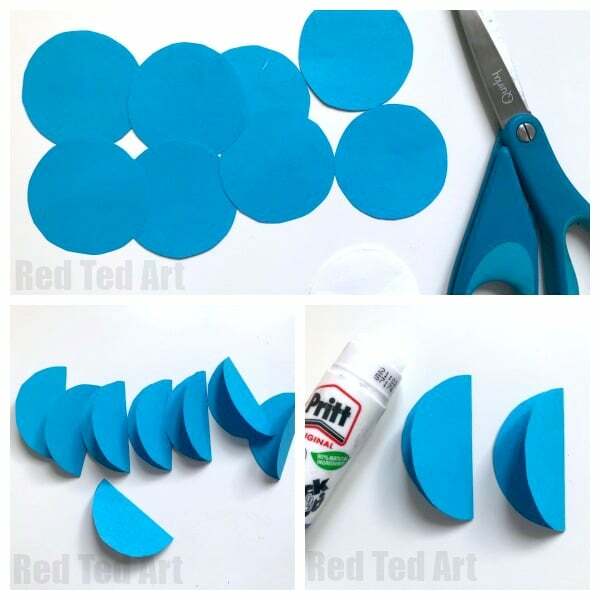 Add glue to one half of the circle and lay a second circle on top – repeat for HALF your circles – so use 4 or 5 depending on number. Make another set of halves glued together (4-5 circles). Cut a longish piece of bakers twine – measure it against the bauble and head to see that it is long enough for hanging. Double it and make a knot one end. 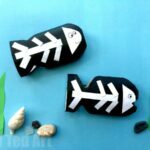 Cut our your fish’s tails, fins, eyes and mouth. You can use our template to guide you or get creative and make your own. 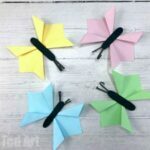 Place them next to a circle template to check for size and see that you are happy! Take your first set of 4 discs. It will have a “spine”. 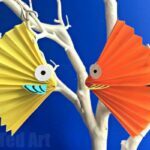 open up one of the discs – with the spine facing “up” and lay flat on the table. So you should have a nice circle – with all the folded sections showing in the middle. It is time for some glue. 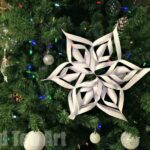 Add LOTS of glue to the spine of the bauble, as well as one side of the bauble. Add your Bakers Twine to the centre of the spine. 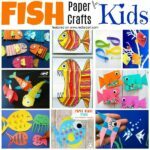 Place your Fish features on the paper. Then take your second set of 4 discs. Again, open one flap – with the spine facing up. Flip over and stick down on top of the other bauble and all the features. Open up all the different disc shapes and even out. We drew little crabs and star fish and small fish with black pen on coloured paper. 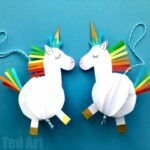 Folded it – and cut out two pieces of paper at the same time (so you have your drawing on the front and a plain piece on the back. Then stick to the bottom of your baker’s twine! 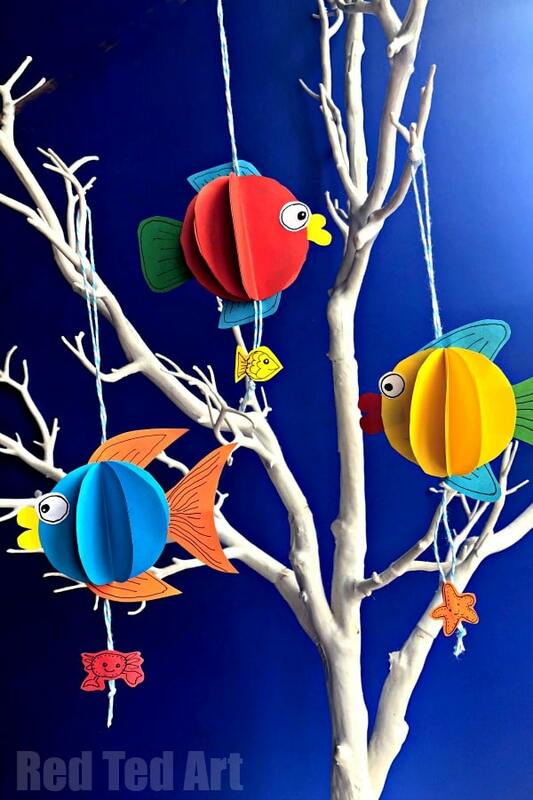 Your 3d Paper Fish is now ready for hanging!!!!! !